A history book, travel guide, and boyhood memoir all crafted into a beautifully drawn book from our favorite aardvark artist. 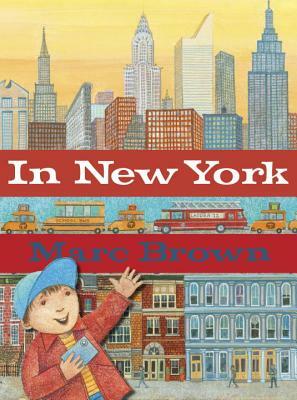 Marc Brown now calls New York City home, and with In New York, he shares his love for all that the city has to offer and all that it stands for, including the way it's always changing and evolving. From its earliest days as New Amsterdam to the contemporary wonders of Central Park, the Statue of Liberty, and the Empire State Building, to the kid-appealing subway, High Line, and so much more, Marc's rollicking text and gorgeous illustrations showcase what he's come to adore about New York after fulfilling his life-long dream to live in the city he fell in love with during a childhood visit. This is at once a personal story from the beloved creator of Arthur, a useful primer for first-time travelers on what to see and do with kids in the Big Apple, and a perfect keepsake after a visit. It's also a great gift for anyone who loves New York, the Crossroads of the World. New York! New York! It's a heckuva town! MARC BROWN, best known as the creator of the Arthur books and TV show, has drawn on his love of American folk art in his paintings for Wild About Books, ZooZical, and Wild About You!, all with bestselling author Judy Sierra. He uses the same style to illustrate New York! New York!, which was inspired by his childhood love for New York City—he'd always wanted to live here, and now he does. "Stupendously detailed. Book your trip now!"